It was a Public Holiday in Saverne today, and the temperature was a bit too warm to take advantage of our "stay in bed till the temperature gets to double figures" rule to provide prolonged horizontality, so we adapted it to be the "stay in bed till the time gets to double figures" rule, which produced a much more satisfactory outcome. 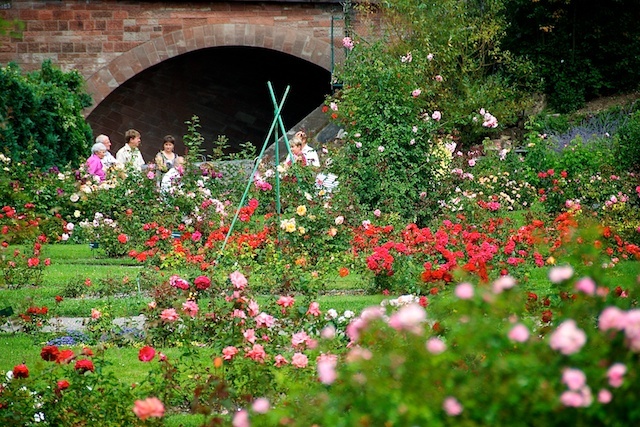 We had heard a rumour that Saverne's world famous rose gardens would be open for free today, and since an opportunity to save 2€ doesn't come along every day we found the impetus we needed to drag ourselves away from our bunk, and muster the energy to walk the hundred metres or so to the gates of the garden. Once inside, we found roses, lots of them which is I suppose exactly what we expected to find in an apparently world famous rose garden. Admittedly it is late in the season and many were past their peak, but there was not a plant which didn't have some sign of bloom hanging sometimes precariously from it. Unlike last year when our journey of discovery did not take place until the onset of winter itself and resulted in a discovery of rose stems by the hundred and not much else, we were able to ramble among the beds mumbling things like "that's pretty" so the casual observer would actually clearly gain the impression that we had a genuine interest in each specimen. In truth, we cannot be described by any stretch of the imagination as "rose fanciers", nor even "flower fanciers" particularly, but they were colourful, it got us out for a bit, and we didn't have far to travel to get home for our afternoon snooze.